This volume continues the story of European political theorising by focusing on medieval and Renaissance thinkers. 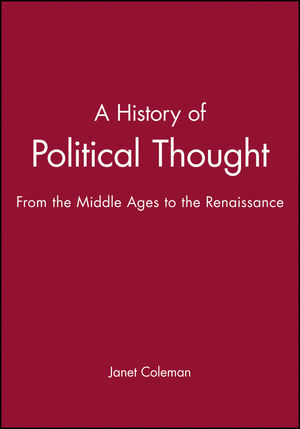 It includes extensive discussion of the practices that underpinned medieval political theories and which continued to play crucial roles in the eventual development of early-modern political institutions and debates. The author strikes a balance between trying to understand the philosophical cogency of medieval and Renaissance arguments on the one hand, elucidating why historically-suited medieval and Renaissance thinkers thought the ways they did about politics; and why we often think otherwise. Janet Coleman is the Professor of Ancient and Medieval Political Thought in the Government Department at the London School of Economics and Political Science. Previously she taught in the Politics Department at Exeter University and for the History Faculty of Cambridge University. She Studied at Yale University and at L'Ecole Pratique des Hautes Etudes, Paris. Her numerous publications include The Individual in Political Theory and Practice (ed. 1996), Ancient and Medieval Memories: Studies in the Reconstruction of the Past (1992), Against the State: Studies in Sedition and Rebellion (1990) and English Literature in History 1350-1400: Medieval Readers and Writers (1981). She is co-founder and co-editor of the international journal History of Political Thought. 1. Medieval Political Ideas and Medieval Society. The Historical Context of Early Medieval Political Thought. Carolingian Christian Kingship and Feudal Society. The Origins of Papal Authority and the Gelasian Doctrine. The Twelfth-century 'Renaissance': Canon Lawyers and their Heirs. The Twelfth-century 'Renaissance' and Civil Lawyers. Natural Law, Rights and the Lawyers Concern for Individual Autonomy. Medieval Education: Practical Moral Philosophy of Ethics, Economics and Politics. The Contribution of Arabic and Jewish Thinking to the Twelfth-century 'REnaissance'. Ethics and Politics in the Liberal Arts Course. The Purpose of Aristotelian Rhetorical Persuasion. The Later Thirteenth-century Understanding of Rhetoric's Service to a Prince: Giles of Rome. Returning to Giles of Rome's Rhetorical De regimine principum. Rhetoric outside the University and Aristotle within the University. Aristotle's Ethics for Medieval University Students. Lawyers Versus the Arts Faculty Philosophers. The New Mendicant Orders: Franciscans and Dominicans and Political Theory. Naming, Natures and Actual Existents. Substantial Form and Corporeal Individuation. Grace Added to and Perfecting, Not Destroying, Nature. The Will's Relation to Justice as Universal Principal and as Historically Contingent Conclusion. Eudaomonia/beatitudo: Imoorality and the Completion of Desire. Rationality and the Freedom of the Will. The Will and the Doctrine of Original Sin. State and Church: The Consequences of Natural Theology. Aquinas on Law and Ploitics. The Consequences of the Fall. Individual Rights and the States's Law. The Thomistic Underpinning of dominium in rebus, Lordship and Ownership of Things. The Justification of Private Ownership. The Origin of the Priesthood. The Relation of the Church to its Property. Some Observations from Discourse 2. Ockham's Positions on Church and State. Ockham's Dualism Concerning Secular and Spiritual Government: Continuing the Narrative. The Exceptional Exercise of Coercive Authority. Ockham's 'Absolutism'. How did Ockham Come to Hold These Views?. The Late Medieval Fortunes of Corporation Theories in the Church's 'Concilar Theory.'. 6. The Italien Renaissance and Machiavelli's Political Theory. The Italien City-States Compared with Other European Cities. The Unconventional AIms of this VChapter. Community, Civitas, Ranked Citizenship and Local Patriotisms. The Involvement of Citizens in Late Thirteenth-century Communal Government. The Communal Ideal and the Menace of Factions. The Evolution of the Florentine Governing Class. Who Wanted to Play an Active Role in Fifteenth-century Florentine Government?. Humanism and Humanist Conceptions of Florentine Republicanism. Founding and Maintaining the 'Stato'. The Fixity of Man's Nature. The 'Fit' Between Character and the Times. The Impetuous Prince Who Must Learn How Not to Have Fixed Dispositions. Learn to Imitate Foxes and Lions. Machiavelli's 'Popular' Government: His Views of the Popolo. "Professor Coleman demonstrates an admirable grasp of the detail and subtlety of the philosophical arguments, and their relation to social and historial circumstances, including trends in wider spheres of thought [...] I found the chapter on Plato particularly illuminating and students will find much of ambiguity in The Republic clarified by Coleman's discussion.[...] Students of specialist courses in Greek, Stoic and early Christian political thought will gain much from this scholarly and erudite book by an acknowledged expert in the field"